This sample is statistically miniscule and irresponsibly narrow, but, given how overwhelming the talent here, it’s easy enough to want to believe that it is representative of the women of Canada generally. This entry was posted in Canada, Popular Culture, Saturday Night, Video on July 31, 2010 by Michael Happy. Linda Hutcheon’s post at The Mark here. Jonathan Allen’s report on the petition and the support of celebrated scholars from all over the world here. Sylvia Maultash Warsh, author of a newly published novel featuring Frye as a character, offers her support for the Centre here. A report from BlogTo here. Maclean’s article, “Academic Vandalism,” here. Prof. Eva von Dassow’s viral video condemning budget cuts to Liberal Arts programs here. Ottawa Citizen‘s article on the student housing crisis that cites the closing of the Centre for Comparative Literature as symptomatic of the wider problem of funding here. Sign the petition to save the Centre here. 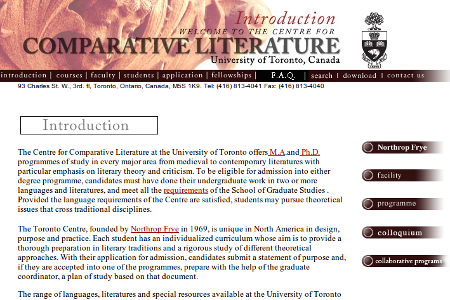 This entry was posted in Centre for Comparative Literature on July 31, 2010 by Michael Happy. 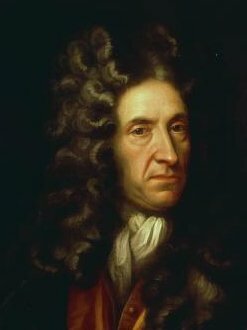 On this date in 1703 Daniel Defoe was placed in the pillory for seditious libel, but was pelted with flowers instead of garbage. This entry was posted in Anniversaries on July 31, 2010 by Michael Happy. This entry was posted in TGIF, Video on July 30, 2010 by Michael Happy. Eva von Dassow’s presentation before a recent public forum of the University of Minnesota Board of Regents. This entry was posted in Centre for Comparative Literature on July 30, 2010 by Jonathan Allan. Every university is short of cash: Even the comparatively wealthy University of Toronto expects to shut down the Centre for Comparative Literature founded by Northrop Frye — the most famous humanities scholar this country ever produced — to save money. The complete story here. Sign the petition to save the Centre here. This entry was posted in Centre for Comparative Literature on July 30, 2010 by Michael Happy. 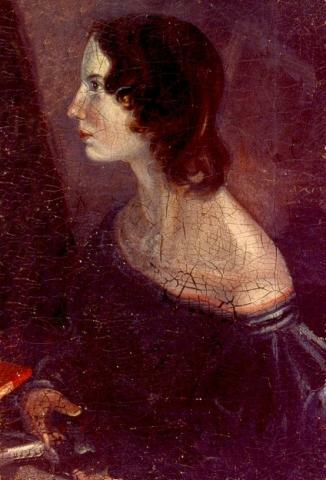 Today is Emily Bronte‘s birthday (1818-1848). Earlier posts on Anne and Charlotte here and here. This entry was posted in Birthdays, Romance on July 30, 2010 by Michael Happy. Under any other circumstances, it’d be cruel to post such a video. But now that the cavernously ignorant and aggressively semi-literate serial liar Sarah Palin is the de facto leader of the Republican Party, it’s not necessarily a laughing matter. This is Basil Marceaux, Republican candidate for governor of Tennessee. This entry was posted in Politics, Video of the Day on July 29, 2010 by Michael Happy. Maclean’s article on the closing of the Centre for Contemporary Literature here. This entry was posted in Centre for Comparative Literature on July 29, 2010 by Michael Happy. 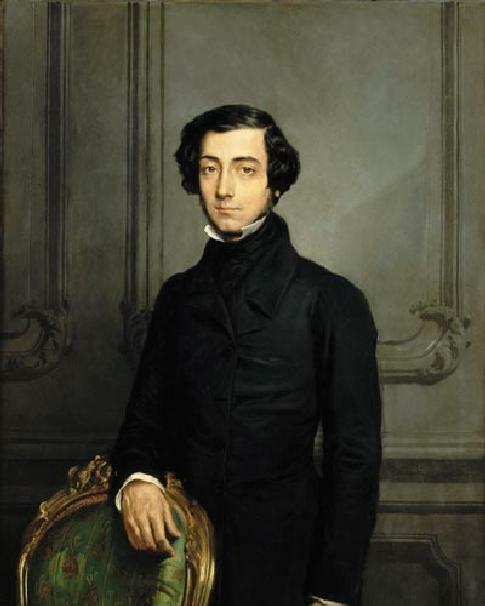 Today is de Tocqueville‘s birthday (1805-1859). Chiasson: I’m considering some thoughts that Tocqueville, the French historian, had about the U.S. and indeed about Canada, which I think have something to do with the fundamentally classless situation of North America. Frye: The thing is that when you don’t have a class structure you have to diversify society in some other way, otherwise you just get a mob; of course, the mob is what Tocqueville is worried about. This is why, I think, this breaking down of the Canadian population into separate groups is so important. Chiasson: And something to be encouraged? This entry was posted in Anniversaries, Canada on July 29, 2010 by Michael Happy.